During the weekend of March 21-22, the best athletes in the country competed for the bouldering title at Montreal's newest climbing venue, Bloc Shop. It was a crazy weekend with a packed field in both the men's and women's category, making for a great show on thought-provoking problems. Here are the highlights of the competition, with Sean McColl winning for the men and Hung-Ying Lee for the women -- Elise Sethna, 2nd overall, was crowned Canadian champion. 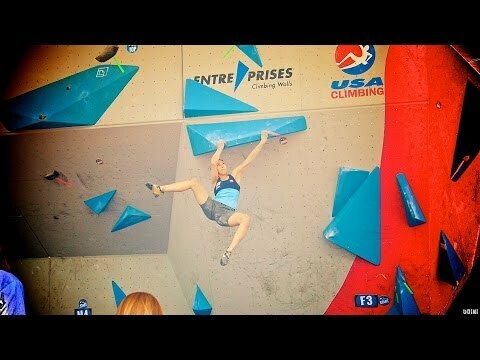 Some really cool problems. I just felt like it might have been nice to hear a little bit more about whether any of the competitors had won this competition before and have some clarification regarding whether or not they were, in fact, leaving it all on the field. Great comp, and nice little highlights compilation here. The requisite 180-degree hang-turn on the men’s problem 4 in the finals was a fun touch. Following that move, somehow Sean managed to make the deadpoint to the finish look easy…as he tends to do. That would be Mathieu Elie. Fun fact: he also set for the comp and works at Bloc Shop. Music credits? Cause got damn. that one guy is funny to watch.